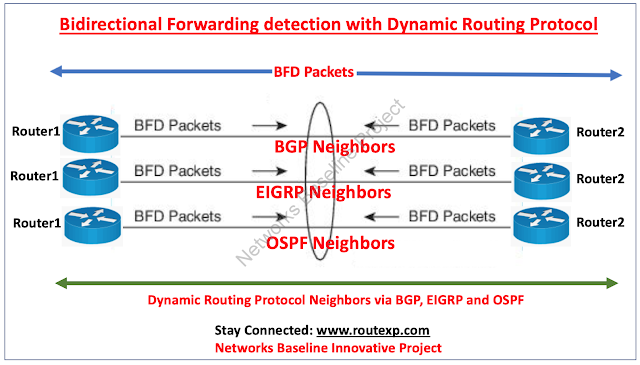 Today I am going to talk about the configuration example of BFD Bidirectional Forwarding detection for Dynamic routing protocols like BGP, EIGRP, ISIS, OSPF and HSRP. Before we will start with the configuration about Bidirectional Forwarding detection- BFD, first we need to understand what actually BFD is all about. BFD delivers a reliable failure detection technique for network supervisors, with fast forwarding path failure detection. With the help of BFD, Network engineers can detect forwarding path failures at a uniform rate, rather than the variable rates for different routing protocol hello mechanisms, network profiling and development will be easier, and re-convergence time will be reliable and anticipated. Cisco supports BFD asynchronous mode, which differs on the sending of BFD control packets among two systems to trigger and preserve BFD neighbor sessions among routers.BFD timers are negotiated, and the BFD peers will begin to send BFD control packets to each other at the negotiated interval. By transfer rapid failure detection announcements to the routing protocols in the local router to begin the routing table recalculation process, BFD provides to significantly cut overall network convergence time. BFD has support to NSF (Non-stop Forwarding) and SSO (Stateful Switchover). We will discuss on the support part in another article soon. What are the restrictions using Bidirectional Forwarding detection? 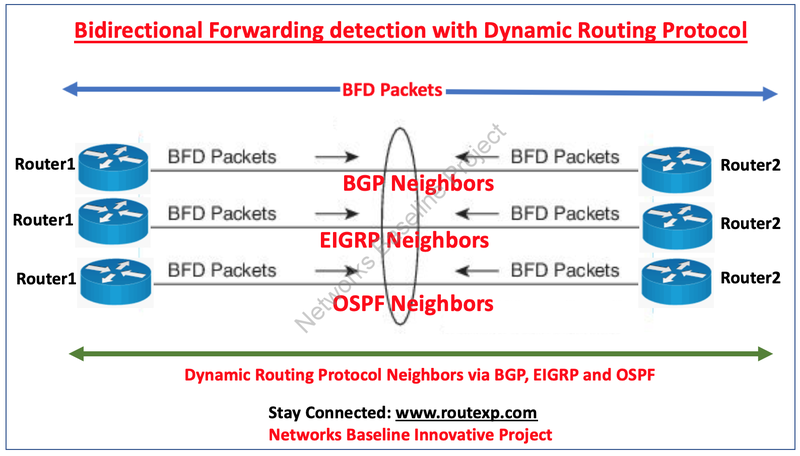 Take a note that BFD works only for directly connected neighbors. BFD neighbors must be no more than one IP hop away. Multihop configurations are not supported. BFD support is not available for all platforms and interfaces. BFD packets are not matched in the QoS policy for self-generated packets. BFD packets are coordinated in the class-default command. So, the operator makes sure of accessibility of suitable bandwidth to avoid dropping of BFD packets due to over subscription. What are the advantages to use BFD in a routing network environment? While dipping the EIGRP, IS-IS, and OSPF timers can result in minimum detection timer of one to two seconds, BFD can provide failure detection in less than one second.As we discussed that BFD is not knotted to any specific Dynamic routing protocol, it can be used as a standard and reliable failure detection gadget for EIGRP, IS-IS, and OSPF. Case1: Configuration example showing the BFD support for BGP protocol as below. Here in the below example we have the device named as RouteXP_R1 where are configuring BFD with BGP. Case 2: Configuration example showing the BFD support for EIGRP protocol as below. Here in the below example we have the device named as RouteXP_R2 where are configuring BFD with EIGRP. Case 3: Configuration example showing the BFD support for OSPF protocol as below. Here in the below example we have the device named as RouteXP_R3 where are configuring BFD with OSPF. Disables BFD on a per-interface basis for one or more interfaces associated with the OSPF routing process.